If you are one of the many traders who find it difficult to stay in a trend – help is at hand. Not once, but twice! 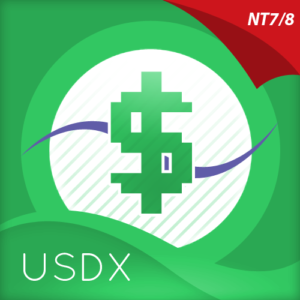 Here you get two NinjaTrader trading indicators for the price of one. The Quantum Trend Monitor will give you the confidence to stay in. With it, and the trend line indicator, you will start to see your trading account grow, and emotional trading will be banished forever. It does what it says on the tin! Monitors the trend to help you maximise your profits. And like all the other Quantum trading indicators, can be configured to your own trading style, giving you complete control. Markets never go up or down in a straight line. They rise and fall constantly, creating pullbacks and reversals. And with each rise and fall, so your emotions rise and fall. Hope, then fear, then hope. This is when the market will try to frighten you out of a strong position. It is when you are most vulnerable. But not if you have the Quantum Trend Monitor indicator. And here, you even get two indicators for the price of one! 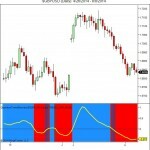 The Quantum Trend Monitor indicator has been designed to absorb these temporary pauses and pullbacks. It analyses the price action, and only changes to a transitional color of dark red or dark blue, if the trend is showing a temporary sign of weakness. If it is a true change in trend direction, the indicator will change to a bright color, as the new trend develops. In other words, the Quantum Trend Monitor, does just that. It monitors the strength of the trend. This is displayed as a solid horizontal bar at the bottom of the screen. 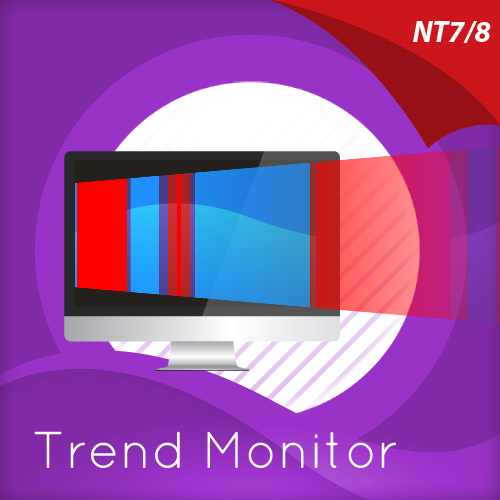 The trend monitor works in conjunction with the Quantum Trends indicator, helping to keep you in – guess what – the trend!! One of the hardest things to do in trading. But, with the Quantum Trend Monitor, it’s a breeze. We call it, ‘the profit generator’, as that’s exactly what it is. 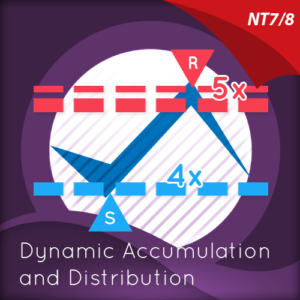 It will help you hold any position for longer periods, maximising your profits. No more closing out early and suffering from trader regret. No more emotional trading decision. 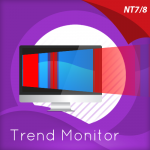 Just watch your Quantum Trend Monitor, which….. monitors it for you! First, the Quantum Trends indicator alerts you to a possible new trend. 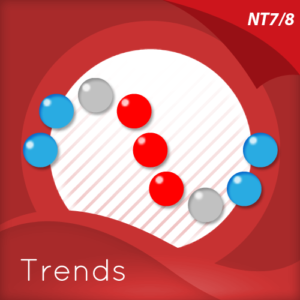 If the trend is strong, the Quantum Trend Monitor will change to either bright blue or bright red, supporting the Trends indicator as the trend develops. Used in conjunction with a multiple time frame approach, it is the indicator which will really make ‘the trend your friend’. Now you will be able to monitor the trends in multiple timeframes in real time, reducing risk, improving returns, and increasing your overall profitability. The Quantum Trends indicator creates the initial signal. Its sister indicator the Quantum Trend Monitor then kicks in. Together, these two indicators provide you with the perfect tools to manage your position. No more fear, no more doubt, no more uncertainty. Watch your trading account grow, as you allow your profits to run – with confidence! And guess what – it doesn’t end there. As the old saying goes – two heads are better then one. Here we could say – two trading indicators are better than one! Now with the Quantum Trend Monitor indicator and the yellow trend line indicator, you have a complete picture of the trend. Staying in and maximising your profits has never been easier. And finally.. this is the next generation of trading indicators and virtually all our indicators can be configured to suit your own trading style. Why? Well, you buy everything else to suit you and your personality – from clothes to cars – so why not trading indicators? After all, as a scalping trader you will have different requirements to a swing or trend trader. You wouldn’t buy clothes that don’t fit, so why put up with indicators that cannot be configured!! Simple. 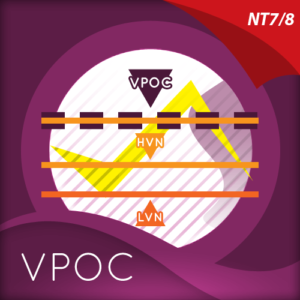 One size fits all does not apply – in our view! So, just like our other indicators, the Quantum Trend Monitor can be ‘tweaked’ to suit your trading style – the benefits are self evident. Your trading consistency and profits will improve. After all, you are now using tools matched to the job. Precision trading requires precision tools and fine tuning. Don’t make do with second best. With the Quantum Trend Monitor you are in control. Just like the volume control on your radio, you adjust the sensitivity of the indicator to suit your trading style. Turning up the sensitivity a little, alerts you earlier to periods of congestion – important if you are purely scalping. Turn it down a little, and this will smooth out these phases and keep you in those longer term trends for maximum profits. The two NinjaTrader trading indicator work in all timeframes from tick and seconds, and from minutes to months. Getting in is easy – staying in is hard. With the Quantum Trend Monitor and the associated yellow trend line indicator, staying in becomes easy too!